Cell culture refers to the process by which cells are grown in a controlled artificial environment. Cells can be maintained in vitro outside of their original body by this process which is quite simple compared to organ and tissue culture. In a cell culture technique, cells are removed from an animal or a plant, and grown subsequently in a favorable environment. For animal cell culture the cells are taken from the organ of an experimental animal. The cells may be removed directly or by mechanical or enzymatic action. The cells can also be obtained by previously made cell line or cell strain. Examples of cells used to culture are fibroblast, lymphocytes, cells from cardiac and skeletal tissues, cells from liver, breast, skin, and kidney and different types of tumor cells. Based on the number of cell division, cell culture can be classified as primary cell culture and cell lines. Cell lines can undergo finite or infinite cell divisions. This is the cell culture obtained straight from the cells of a host tissue. The cells dissociated from the parental tissue are grown on a suitable container and the culture thus obtained is called primary cell culture. Such culture comprises mostly heterogeneous cells and most of the cells divide only for a limited time. However, these cells are much similar to their parents. Depending on their origin, primary cells grow either as an adherent monolayer or in a suspension. These cells are anchorage dependent and propagate as a monolayer. These cells need to be attached to a solid or semi-solid substrate for proliferation. These adhere to the culture vessel with the use of an extracellular matrix which is generally derived from tissues of organs that are immobile and embedded in a network of connective tissue. Fibroblasts and epithelial cells are of such types. When the bottom of the culture vessel is covered with a continuous layer of cells, usually one cell in thickness, these are known as monolayer cultures. Majority of continuous cell lines grow as monolayers. As being single layers, such cells can be transferred directly to a cover slip to examine under microscope. Suspension cells do not attach to the surface of the culture vessels. These cells are also called anchorage independent or non-adherent cells which can be grown floating in the culture medium. Hematopoietic stem cells (derived from blood, spleen and bone marrow) and tumor cells can be grown in suspension. These cells grow much faster which do not require the frequent replacement of the medium and can be easily maintained. These are of homogeneous types and enzyme treatment is not required for the dissociation of cells; similarly these cultures have short lag period. After the cells are isolated from the tissue and proliferated under the appropriate conditions, they occupy all of the available substrate i.e. reach confluence. For a few days it can become too crowded for their container and this can be detrimental to their growth, generally leading to cell death if left for long time. The cells thus have to be subculture i.e. a portion of cells is transferred to a new vessel with fresh growth medium which provides more space and nutrients for continual growth of both portions of cells. Hence subculture keeps cells in healthy and in growing state. A passage number refers specifically to how many times a cell line has been sub-cultured. In contrast with the population doubling level in that the specific number of cells involved is not relevant. It simply gives a general indication of how old the cells may be for various assays. 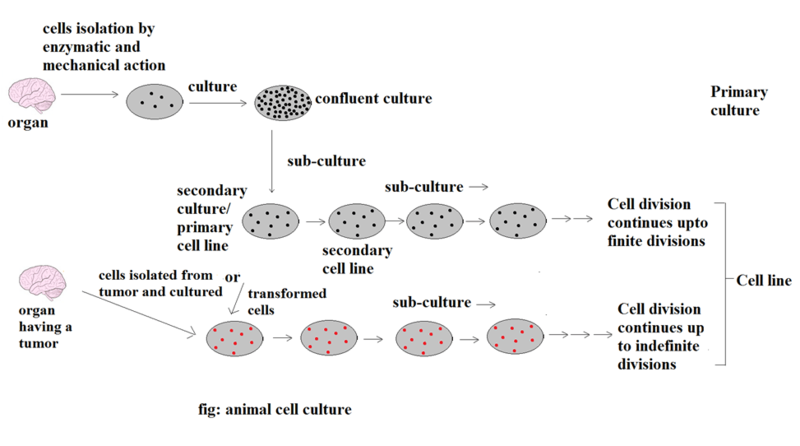 When a primary culture is sub-cultured, it is known as secondary culture or cell line or sub-clone. The process involves removing the growth media and disassociating the adhered cells (usually enzymatically). Sub-culturing of primary cells to different divisions leads to the generation of cell lines. During the passage, cells with the highest growth capacity predominate, resulting in a degree of genotypic and phenotypic uniformity in the population. However, as they are sub-cultured serially, they become different from the original cell. The cell lines which go through a limited number of cell division having a limited life span are known as finite cell lines. The cells passage several times and then lose their ability to proliferate, which is a genetically determined event known as senescence. Cell lines derived from primary cultures of normal cells are finite cell lines. When a finite cell line undergoes transformation and acquires the ability to divide indefinitely, it becomes a continuous cell line. Such transformation/mutation can occur spontaneously or can be chemically or virally induced or from the establishment of cell cultures from malignant tissue. Cell cultures prepared in this way can be sub-cultured and grown indefinitely as permanent cell lines and are immortal. These cells are less adherent, fast growing, less fastidious in their nutritional requirements, able to grow up to higher cell density and different in phenotypes from the original tissue. Such cells grow more in suspension. They also have a tendency to grow on top of each other in multilayers on culture-vessel surfaces. Lineage of cells originated from the primary culture is called strain. These are either derived from a primary culture or a cell line by the positive selection or cloning of cells having specific properties or characteristics. A cell strain often acquires additional genetic changes subsequent to the initiation of the parent line. The culture media used for cell cultures are generally quite complex, and culture condition widely varies for each cell type. However, media generally include amino acids, vitamins, salts (maintain osmotic pressure), glucose, a bicarbonate buffer system (maintains a pH between 7.2 and 7.4), growth factors, hormones, O2 and CO2. To obtain best growth, addition of a small amount of blood serum is usually necessary, and several antibiotics, like penicillin and streptomycin are added to prevent bacterial contamination. Temperature varies on the type of host cell. Most mammalian cells are maintained at 37oC for optimal growth, while cells derived from cold- blooded animals tolerate a wider temperature range (i.e. 15oC to 26oC). Actively growing cells of log phage should be used which divide rapidly during culture. Primary cell cultures are prepared from fresh tissues. Pieces of tissues from the organ are removed aseptically; which are usually minced with a sharp sterile razor and dissociated by proteolytic enzymes (such as trypsin) that break apart the intercellular cement. The obtained cell suspension is then washed with a physiological buffer (to remove the proteolytic enzymes used). The cell suspension is spread out on the bottom of a flat surface, such as a bottle or a Petri dish. This thin layer of cells adhering to the glass or plastic dish is overlaid with a suitable culture medium and is incubated at a suitable temperature. Bacterial infections, like Mycoplasma and fungal infections commonly occur in cell culture creating a problem to identify and eliminate. Thus, all cell culture work is done in a sterile environment with proper aseptic techniques. Work should be done in laminar flow with constant unidirectional flow of HEPA filtered air over the work area. All the material, solutions and the whole atmosphere should be of contamination-free. If a surplus of cells is available from sub-culturing, they should be treated with the appropriate protective agent (e.g., DMSO or glycerol) and stored at temperatures below –130°C until they are needed. This stores cell stocks and prevents original cell from being lost due to unexpected equipment failure or biological contaminations. It also prevents finite cells from reaching senescense and minimizes risks of changes in long term cultures. When thawing the cells, the frozen tube of cells is warmed quickly in warm water, rinsed with medium and serum and then added into culture containers once suspended in the appropriate media. One of the most important uses of cell culture is in research and production of vaccines. The ability to grow large amounts of virus in cell culture eventually led to the creation of the polio vaccine, and cells are still used today on a large scale to produce vaccines for many other diseases, like rabies, chicken pox, hepatitis B, and measles. In early times, researchers had to use live animals to grow poliovirus, but due to the development of cell culture technique they were able to achieve much greater control over virus production and on a much larger scale which eventually develop vaccines and various treatments. However, continuous cell lines are not used in virus production for human vaccines as these are derived from malignant tissue or possess malignant characteristics. Cell culture is widely used for the propagation of viruses as it is convenient, economic, easy to handle compared to other animals. It is easy to observe cytopathic effects and easy to select particular cells on which virus grow as well as to study the infectious cycle. Cell lines are convenient for virus research because cell material is continuously available. Continuous cell lines have been extremely useful in cultivating many viruses previously difficult or impossible to grow. Cell culture is one of the major tools used in cellular and molecular biology, providing excellent model systems for studying the normal physiology and biochemistry of cells (e.g., metabolic studies, aging), the effects of different toxic compounds on the cells, and mutagenesis and carcinogenesis. The major advantage of using cell culture for any of these applications is the consistency and reproducibility of results that can be obtained from using a batch of clonal cells. Normal cells can be transformed into cancer cells by methods including radiation, chemicals and viruses. These cells can then be used to study cancer more closely and to test potential new treatments. Cells having a functional gene can be replaced to cells which are having non-functional gene, and for which the cell culture technique is used. Cell culture techniques are used to know the working of various immune cells, cytokines, lymphoid cells, and interaction between disease causing agent and host cell. Cell lines are also used in in-vitro fertilization (IVF) technology, recombinant protein and drug selection and improvement. Pelczar MJ, Chan ECS, Krieg NR (2007). Microbiology. 5th Tata McGraw-Hill. pp. 455-457. Kindt TJ, Goldsby RA, Osborne BA (2007). Kuby Immunology. 6th W.H. Freeman and Company, New York. pp. 547-551.